I initially chose to publish this article anonymously. When some of the bullies named in the article made threats, including physical intimidation, I suggested Hellocare remove the article from their website until I found time to re-write the article. I am named as the author of the revised article. I am also unfamiliar with this lingo: “touchpoints for consumers in their ageing journey”, “a well-supported research translation pipeline” and “the creation of a research translation ecosystem”. Touchpoints, pipelines and ecosystems. What planet are you on? One thing, however, was clear: the strategy was “developed with the industry, for the industry”. The bias towards an ‘industry-led’ (i.e. not a ‘consumer-led’) strategy was explicit. The aim was “to develop an industry-led strategy focused on the consumer”. Having no union or genuine consumer representation on the taskforce committee was also an ominous sign. Without explaining who or what are “job families”, or indeed the “Job Family Framework” methodology, Korn Ferry produced a colourful report – one for all the family. However, the analysis is poorly explained. Even with my expertise as a researcher, I could not make head or tail of it. Who could? The Royal Commission into Aged Care Quality and Safety began last Friday. 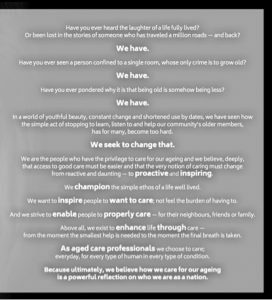 Scott Morrison announced the Royal Commission on the eve of last year’s ABC Four Corners’ investigation into inadequate personal care, negligence, neglect, abuse and assault in aged care homes. Before jumping into another expensive royal commission, perhaps Scott Morrison should have reviewed the numerous inquiries, reviews, consultations, think tanks and task forces over the past 10 years. These inquiries provide evidence of appalling standards of care in some aged care homes. They have also resulted in a large number of recommendations, most of which have been ignored by successive governments. The most dispiriting aspect of all these inquiries is the number of submissions by residents, relatives and staff that have been ignored. Submissions to the recent Review of National Aged Care Quality Regulatory Processes indicated strong support for mandatory staff ratios in aged care homes and for registered nurse to be on duty at all times. However, there was no mention of this in the report. To prevent poor standards of care in aged care homes, a sufficient number of trained staff must be employed. Although it’s not the only remedy, evidence shows the value of mandating staff ratios in aged care homes. The government values the safety of children in childcare enough to mandate ratios. The government also values the safety of patients in hospitals enough to mandate ratios. Clearly the government does not value the safety of older people in aged care homes enough to mandate ratios. The Terms of Reference for the Royal Commission are primarily about the future of aged care. However, if the Royal Commission does not look back, it will not be able to move forward without making the same mistakes. As Albert Einstein said: “We cannot solve our problems with the same thinking we used when we created them”. To improve standards of care in aged care homes, The Commissioners must review evidence on quality indicators such as pressure sores, medication errors, weight loss, falls, infection rates admissions to hospitals, staffing levels and training in all aged care homes. Currently, these data are not publicly available. Who decided that data on residents’ safety and wellbeing in aged care homes must be kept top secret? To answer this question, we need to go back more than 20 years when the Aged Care Act 1997 was drafted. The Aged Care Act 1997 was a turning point for aged care policy in Australia. It encouraged a large increase in private investment. Private equity firms, new foreign investors, and superannuation and property real estate investment trusts entered the residential aged care market. Many of these companies focus on profits rather than standards of care. The dean and head of the University of South Australia’s law school Wendy Lacey has criticised the Aged Care Act, arguing that there is “a complete absence of any positive and mandatory legal obligation on the part of facilities to take proactive measures to promote mental health and wellbeing of their residents”. The standards of care in aged care homes are a human rights issue. The only way to ensure higher standards of care is for the government to rewrite the Aged Care Act. The government needs to work not only with aged care providers, but also staff, residents and their families. We need a new Aged Care Act that focuses on Human Rights of older Australians not the profits of providers. We need a new Aged Care Act to ensure the highest possible standards of care in all aged care homes. “There are some aged care homes that are chronically understaffed and the care is just not good enough.” Dr Sarah Russell speaks about the loss of her mother and potentially preventable deaths in our aged care system. Before jumping into another expensive royal commission, it would have been prudent for Scott Morrison to review the numerous inquiries that both LNP and ALP governments have initiated over the past decade. Surely the government didn’t need Four Corners to inform them that the aged care sector is a national disgrace. 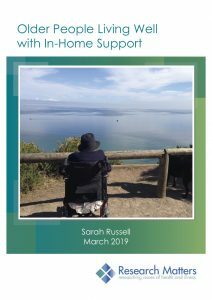 Author Sarah RussellPosted on September 19, 2018 September 25, 2018 Categories Royal Commission1 Comment on Has government by media replaced consideration of evidence in aged care?